A South American specialty dish that originated in either Ecuador or Peru: there seems to be a dispute as to which country the dish first appeared. The dish consists of raw fish pieces (sturdy white-fleshed fish is most often used) or other types of seafood, marinated in citrus juice for a period of time; usually a minimum of twelve hours, and often for more than a day. The marinating process actually imparts a cooked (pickled) quality to the flesh of the fish rather than the transparent, raw characteristic that one would expect of fish that has not been cooked with heat. The acidity of the citrus juice modifies the properties of the proteins in the fish, creating this cooked effect. Lime or lemon juice is most often used, although any type of citrus juice is suitable. 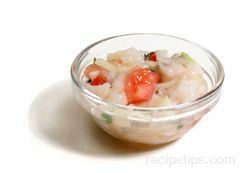 There are many recipes for ceviche. The one ingredient that is common in all of them (besides fish or other seafood) is the citrus juice, which is a necessity for creating the dish in the proper manner. Ingredients such as onions, chile peppers, tomatoes, avocados, celery, mint, cilantro, and chopped fruit are commonly found in the many variations of ceviche. The dish is a staple in other South American countries besides Ecuador and Peru, and it is popular throughout Central America, Mexico, Caribbean countries, Spain, and even in portions of the United States, especially southern Florida. 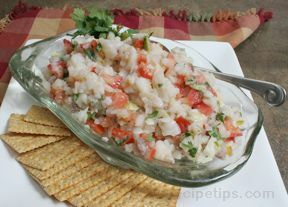 Depending on the region where the dish is prepared, Ceviche may also be spelled, cebiche or seviche. 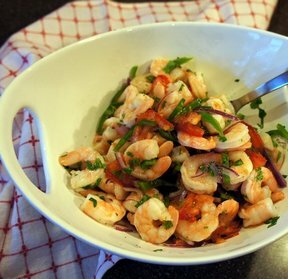 Ceviche is most often served as a salad, side dish, or appetizer, but in some cases (depending on the ingredients) it makes a substantial main meal.